Although a homeschool language arts curriculum makes a parent feel like they are covering everything that needs to be covered in a year, it's not necessarily the only way to teach language skills. 1. Copy - Have your children copy poems, Bible verses, pages from books, signs, historical documents, or anything else they can find. This helps them model good language skills and gives them a feel for how a sentence is supposed to sound when they begin writing. A 5 or 6 year old may only copy a word or a sentence. An older child can copy anywhere from a 1/2 page or much more. Even when your children know how to read and write well, copy work can still be a part of their work for the day. 2. Read to your children - When children are little we start with picture books and then sometimes forget to keep reading to them. By reading chapter books to your children, you help them develop their imagination along with a sense of good writing. If children can't sit still for long, allow them to play Legos, do puzzles, or some other quiet play that will keep their fingers busy but their minds open. Reading to older children is just as beneficial as reading to younger children. If you can read a book together as a family, that is even better. Keep reading to your children as long as they will let you. 3. Write each day - Again, whether your child is 5 or 15, they should be doing some type of writing. When a child is little they can draw a picture and add a title to the picture (or ask you to write it for them so they can copy it). Sometimes giving children a picture can spur them onto write a story about the picture. Most writing should be information. Rarely in life do we have to write a creative story. Most writing as adults is information writing. If your child enjoys writing stories, then let him do that for a time, but make sure that you move towards more informative writing. If you have been reading aloud to your children, they will already know what a good story or paper should sound like. This will help them greatly in their writing. I have tried many homeschool writing programs. Although there are a few notable ones, none of them were as effective or easy to implement as just writing a page a day or several pages a week. 4. Read on their own - Once children learn how to read they should be encouraged to begin reading on their own. You can still read to them, but they need to read their own books too. The first goal for parents with homeschool language arts is to teach their children to read. This can often be a stressful thought for many parents, but it really doesn't have to be. My recommendations for what to use to teach your child to read can be found at homeschool reading. 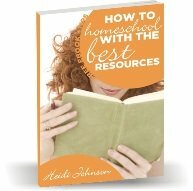 You should get all your questions answered there, but if you need to ask me a specific question, you can post it at homeschool help at the bottom of the page. Younger children can read a page, chapter or several chapters. Older children can read 1-2 or more books a week. There are so many great books out there. You should be able to find something to interest any reader. 5. Grammar - Although there are many grammar programs out there that you can use as part of your homeschool language arts program, if your child is writing and having to correct their writing, they should learn almost everything they need to know. You can use a program like Easy Grammar or Winston Grammar once your child is around 10-12 years old. At our house we do Mad Libs once a week all together. Younger and older children alike can participate together. Then everyone gets to hear the goofy story they all created. My favorite grammar program for younger children is First Language Lessons written by Susan Wise Bauer, the author of the Well Trained Mind. We liked this for our homeschool language arts program because we could do most of it orally, yet I felt we were still learning all we needed to know. 6. Spelling - Here's a hot topic. Many children are just natural spellers and others use all the books and methods and still don't spell well. Some spelling can be learned from correcting their writing papers. When a word is misspelled, they have to look it up and see how it is supposed to spelled. There are a few spelling programs out there that can be used if your child enjoys workbooks or tests. Spelling Power, Spectrum Spelling, Apples Spelling (for older students). The best program for spelling that I have found is Spellquizzer. It can be used for grades K-12, for all your children, by itself or in cooperation with ANY spelling program. My son loves using this interactive program and it has been very effective in helping him be a good speller. If you need a program to teach your younger child how to spell, then All About Spelling is a great choice. We enjoyed the program and liked the interactive approach that they used. Your homeschool language arts curriculum will probably include all of the areas mentioned above. You can put something together on your own or purchase a packaged curriculum depending on your child's learning style and your homeschool budget.